The internet has changed the way people view and interact with content and now, mobile has changed the way people interact with the internet. A recent report gives marketers information that helps them better understand the things shaping the mobile web. According to data shared by Flurry, apps now reign supreme as the top media channel in the United States, even without the help of the mobile browser. New data shows that time spent inside mobile applications by the average US consumer has exceeded that of TV for the first time ever. 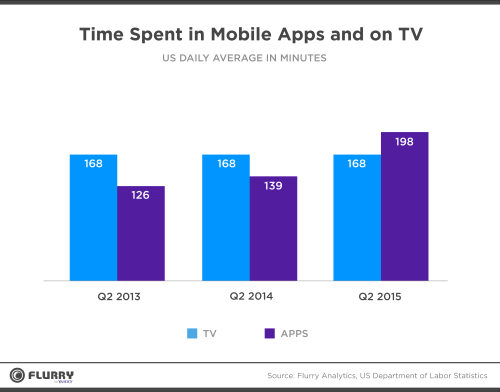 According to the report from Flurry, Americans spent 168 minutes each day watching television during Q2 2015, they spent half an hour more (198 minutes / day) using apps on a mobile device. This is part of a continuing upward trend of more people using apps. Back in 2013, American consumers spent 126 minutes per day using apps and in 2014, the amount of time had risen 139 minutes. 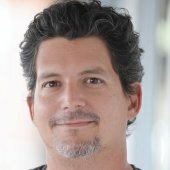 According to Simon Khalaf, SVP product and engineering at Flurry, “the second screen phenomena is clearly prevalent, especially among generations Y and Z” and, as such, “while time spent on TV hasn’t decreased, it is hard to say how much of that time is actual watching, versus having background noise to the plethora of apps being actively consumed on mobile devices”. Apps represent a huge financial opportunity for business owners and marketers. It’s not just that people are spending time using apps. The fact that apps can immediately be monetized, unlike TV content, represents a benefit to business owners. Flurry’s researchers noted it’s estimated that revenues from in-app purchases will exceed advertising revenues for the first time ever, later this year. In 2014, App stores generated $21 billion in sales on a worldwide basis, while the mobile ads industry generated $23 billion USD during the same time. This year, Flurry estimates that in-app purchases will exceed $33B USD and the ads industry (excluding search) is expected to generate $31B USD. How businesses react to data like this depends on the nature of the business. The declining importance of cable, and television in general, is distressing to cable and network TV executives. However, the impressive growth in in-app sales should encourage some traditional media companies to move its content to apps and stream it over-the-top, charge consumers for it through the App Stores, and still make money from ads. There are several ways business owners and marketers can use this information to their advantage. The obvious option, as mentioned above, is to create an app for mobile to give consumers another option for how to access their favorite content. As major brands like Hulu, HBO and Netflix have shown, offering mobile apps can increase viewership and subscriptions. Making an apps is easier and more affordable than in the past, but it does represent a barrier for many small businesses. The other way to take advantage of the growing amount of time spent in mobile apps is to get content shown within those apps. The most popular app remains Facebook, so business that use Facebook to share articles, images and video and more, will get more response than they would from just using the internet alone. Similarly, getting products listed on Amazon and eBay, which have popular apps, can also improve sales for online retailers. For more information on using mobile marketing to improve your business, read this article on how consumers are using mobile devices to research products.